Screw cracking is very common especially if the deck is built by someone who’s unfamiliar with hardwoods like Ipe. This usually occurs when installers top-screw deck boards too close to the end especially without predrilling. Hardwoods have very tight grains and when you drive a screw close to the edge where the board ends, you risk splitting the board completely. End checking occurs because of lack of end seal when cutting. A lot of deck builders install cut boards right away, but that can’t happen with Brazilian hardwoods. You have to remember that Brazilian hardwood’s wood fibers are very dense. When you expose the fibers through the end grain, moisture is rapidly absorbed and released, causing rapid expansion and contraction. This leads to checking in the wood ends. To prevent this, apply a wax based sealer like DeckWise Ipe Seal to every fresh cut you make. 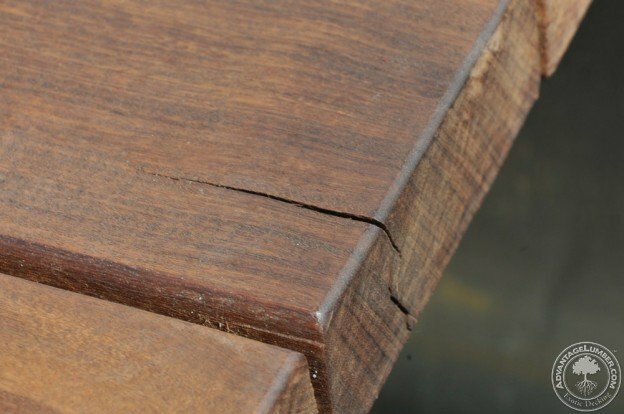 One of the more serious issues that arise from improper end grain maintenance is board cracking. Board cracking is mainly caused when water gets into the end checks. When water enters small cracks during the colder months, it freezes, expands, and forces the cracks to grow until they run the whole length of the board. As more and more water enters, it feeds a vicious cycle that will ruin your deck. Aside from the various issues mentioned above you can also experience cupping and warping of the board. If there is no end seal applied, the boards will quickly absorb and release moisture from the ends. This will lead to board movement near the ends, and no screw can prevent this. Finally, remember that if unsealed ends are constantly exposed to moisture (for instance, near a pool, fountain, Jacuzzi, etc.) it can lead to rot. Brazilian woods are highly rot-resistant, but even they are no match when water penetrates the board to its core. It seems like the stuff of nightmares, but all it takes to prevent it is a knowledgeable installer. Don’t put screws too close to the end, and apply end seal to all your cuts. They’re simple solutions that often go unheeded. So how close is too close for end board screw placement? If two boards are meeting over a 2×8 joist, there is little room available, i.e. 3/4″ from end at most to place the screws, unless additional blocking is provided. Need some recommendation advice on this point. Using 1/2″ from the end as minimum will work out. As always, just make sure to predrill prior to installing the screw. That’s the most important aspect. Thanks you for reaching out Dave. Would living in an area with a lot snow and almost daily freeze – thaw cycles cause issues with cracking? I’m already experiencing cracking on my hardwood decking (because the ends were not sealed!). Would applying IPE seal prevent further damage or is it just too late and I’ll need to replace when necessary. Appreciate any help. Checking will only worsen as water gets inside and freezes, widening the cracks. Further drying, accelerated by the existing cracks, will also cause the checking to worsen. Regular coats of Ipe Oil may help to slow this process, but it’s not what the product was designed for and won’t stop it indefinitely. Ipe Seal on the end grain will prevent new checks from forming, but won’t be a good solution for existing cracks (it would have to go on the deck surface, which will look bad and will wear off under foot traffic). As long as the checks are small, they won’t compromise the structure of the deck.